Dr. Jie He is a very pleasant and professional doctor. I enjoyed my visit and walked away feeling better and lookforward to additional appointments with him. 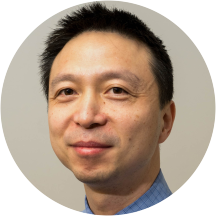 Jie He is a friendly and engaging endocrinologist based in Rockville, MD. Dr. He received his medical degree from the Shanghai Jiao Tong University School of Medicine in China and completed his residency in internal medicine at the William Beaumont Army Medical Center. He also completed a fellowship in diabetes/metabolism and endocrinology at the National Institutes of Health Clinical Center. Dr. He is board certified by the American Board of Family Medicine and affiliated with the Shady Grove Adventist Hospital. He is a member of the Endocrine Society and the American Association of Clinical Endocrinologists. Dr. He is adept at managing a wide range of illnesses. He is deeply committed to the well-being of his patients and takes a thorough and precise approach to his consultations, which typically last about 30 minutes. Some of the medical complaints that Dr. He has managed or treated include hyperthyroidism and hypothyroidism, goiter, polycystic ovarian syndrome, thyroid cancer, and obesity. He speaks English and Mandarin fluently. Dr. Jie is very nice and professional! He listened to all my concerns . I can feel like I can trust him after the 1st visit . I won’t be seeing Any other endocrinologist . Great, took my insurance with BCBS, had confidence with medication strategy. Difficult to understand sometimes when he spoke. Recommend having latest blood work done and faxed to office. I was promptly seen. Staff was great. Dr. He LISTENED in addition to offering his opinion. He was very concerned for my illness, and showed compassion to my situation. Dr. He was very professional, courteous and an extremely kind, he assured me that changing the dose of my medication would make me feel much better. I now have this incredible energy and become 99% of myself. Thank you so much Dr.He. Dr. He is very patient and seems like he cares about his patients. He asks a lot of questions and takes his time to get the best understanding on what is going on and what will be the best treatment plan. very polite great listener. he seemed to care about my problems. very helpful. Always has positive things to say. I have a lot health problems. He always gives advise so you can keep going in positive way. My general practitioner was handling things with my thyroid until Dr. He came along. I'm very glad to have him. He's very kind and extremely knowledgable. Dr. Jie He was very friendly and listened to my questions and concerns. I felt like my feelings were heard and the tests ordered were well suited to my current state. He was very professional, told me the facts, and was willing to sit and answer my questions, even though some were a little bit of a panicked worry. Dr. He is extremely knowledgeable, patient, and positive. I haven't had an endocrinologist I liked as much as him. I even spoke with previous endos and nurses who sing his praises, which validated my positive feeling about him. He moves quicklyduring appointments and I tend to want to get out as early as possible, so...my advice is to make your appointment as early in the morning as you can (not late in the afternoon - because late patients back things up). They do blood work in the office from 9am-12pm which I find extremely convenient. Go a week in advance to do the blood work - it only takes about 15 minutes. Go to your appointment prepared in advance with questions, and download your sugars a couple days in advance (if you have an insulin pump). He is very good with the pump. I enjoyed by visit with Dr. He. Since I am a first-time patient, my wait to see him took about 30 minutes while I was filling out new patient forms. Once I completed the forms, I saw him right away. Hewas very pleasant and personable. He seemed very knowledgeable about my condition and patiently and thoroughly answered all my questions. This first visit gave me a lot of confidence that I chose the right doctor and I have scheduled a follow-up visit with him. His impressive credentials are matched by his professional manner, his clear mastery of internal medicine and endocrinology, and his patient care. He balances the immediate needs and concerns of his patients with thorough diagnostics resultingin optimal care and optimal confidence on the part of the patient. It is also amazing to find such a good and local doctor that takes my insurance. I recommend him highly. DR He is a very thorough doctor.He spends quality time with his patients, and make sure we get the best care. he follows up after blood work, he reminds you of your appointment. i always recommend him to persons seeking carein his feild. I trust Dr He with my health. Visitors was okay. The receptionist had no customer service at all, didntgreet me as I entered. When he finished with my paper work he placed it on the counter, without telling me it was there. I just happened to be returning my paperwork I filled out. Great bedside manner. Listens to you. He was very kind, thoughtful and did not rush me through the appointment. He addressed all of my questions, offered support and guidance, and explained himself thoroughly. Dr. He was very personable and made me feel comfortable right away. I didn't feel at all rushed or like just another patient, he really took the time to get to know me and what it was I was going through. Quite good. Very courteous. Knows his stuff. Had a great experience with Dr Jie He. He was very friendly, well informed, and willing to listen. He made some excellent recommendations, which I am following up on. He was amazingly kind and patient. He took time to talk to me and I felt extremely comfortable. I really enjoyed my experience at Dr. He's. There was barely any wait and he saw me right away. The evaluation seemed professional and accurate. Dr. Jie He was very friendly and very knowledgeable and am following up with him again in six months. I greatly appreciate the time he gave me and appreciated the fact that he could keep up with my rapid-fire questions. Anyoneneeding an endocrinologist who is in the region should consider Dr. He. Dr. He had a great bedside manner. The visit was great. The only reason I had any wait was because this was my first visit to Dr. He and I had to fill out the requisite paperwork. One of the first thing Dr. He wanted to understand whenI came to his office was what has made me unhappy with my previous Dr's, and what do I expect from him to make sure all my needs are met. That's something I've never had a Dr do before, and made it clear to me that my satisfaction is important to him. I didn't feel rushed at all, and Dr. He answered all the questions I had and made sure that I understood all the information he was giving me. This was my first appointment with Dr. He, so I look forward to seeing him again. Very thorough, thoughtful, and caring. I think he will help me with my medical issues. Looking forward to my other visit.